A lecture with diagrammes given at KunstAllmend (Artistic Commons) Symposium at Dampfzentrale, Bern, CH. Initiated by Nicolas Y Galeazzi, 2014. To enact the common, to fabulate a territory for the practicing of forms of life afforded by commoning, can come by no other way than by reengineering the value-form. In a period where we have been inhabiting the ongoing and ever morphing topology of the neoliberal revolution, the terrain has been stretched, pulled and twisted in ever liquid-mercurial configurations, unbroken by objective failings and undelivered promises of the model. The unruptured sturdiness of this plastic topology, in the face of increasing epistemic impasses, has left us caught in an ideological spiral, all the more since this topology based on competitive market-efficiency declares itself free of ideology tout court. Far surpassing Marx’s dictum on ideology that says “they do not know it, but they are doing it”, Zizeks’ updated version in times of functional cynicism of “they know it, but they are doing it anyway” is far more pervasive since it renders the potential relation of knowledge and action fundamentally impotent. In Marx’s understanding of ideology, there is a potential space to acquire knowledge in the reshaping of action (if they would know it, maybe they would do it differently), yet in Zizek’s version that potential space of agency has been seemingly dissolved, so what ultimately remains is the decoupling of thought and action. This meta-crisis between thinking and doing leaves us in a state of disorientation, a space of pure reflex, where we feel compelled to act, but have no sense of orientation as to how we may act successfully to overcome the impasses endemic to what we know. What Badiou has called ‘organized disorientation’, this meta-crisis thrives on a certain disavowal of knowledge, where we don’t believe in what we know, and so what we know carries inconsequential bearings on our actions. 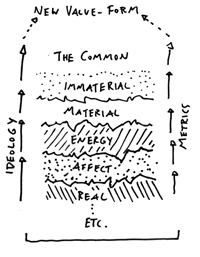 A reengineering of the value-form in the project of commoning is therefore as much a task of constructing ideological and metric strategies to forge a new territory of socio-object-umwelt relations, composed of the nested complexity between the material (objects and stuff), the immaterial (energy, movement, affect); the real and the semiotic. This, as yet, inexistent territory of the could be, faces a rather Promethean challenge to recouple thought and action, knowledge and belief in said knowledge, where the real of ongoing epistemic differentiation can pierce through and render permeable the existent neoliberal topos.